Amata Garden Resort is on the eastern edge of Inle Lake at Ingyin Gone Village, about 90 minutes drive from Heho airport. It is set in 18 acres of lush gardens and has 60 rooms and 2 suites spread over 3 floors with lake or mountain views. Rooms feature a range of modern conveniences such as flatscreen TV, IDD phone, free Wi-Fi, tea and coffee maker, minibar and en-suite bathroom. Air conditioning and heating help moderate the temperature whatever the outside weather. The Royal Lotus restaurant serves a range of cuisines including Chinese, continental and local Shan dishes, and the bar has a terrace where you can watch the sunset over the still waters of the lake. There is a spa where you can indulge in your preferred treatment and a gift shop for souvenir shopping. The hotel has its own jetty and is an ideal base from which to explore the lake, its floating gardens, villages and markets. 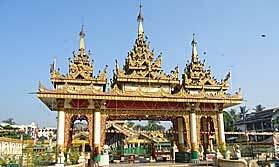 We know and love Burma, and would be delighted to help you plan your perfect trip here. Let us help you plan your perfect tailor-made holiday to Burma. Talk to one of our travel experts. Tell us what you want, and we will tailor make your perfect trip. Gilded temples, red-robed monks, and sacred pagodas, this holiday has it all. A perfect introduction to this fascinating country. "Wonderful room, staff brilliant, beautiful setting. Food much too expensive."